Although we can already celebrate some victories, the truth is that there is still much work to be done in order to ensure that the Mediterranean waters under Spanish jurisdiction are declared by law, a ‘Zone Free from exploration of hydrocarbons‘. Unfortunately, still pending in the area Balearic-Levantine-Catalan of the Mediterranean, there are several projects of oil exploration and several applications for new permits of hydrocarbon research, in addition to granting effective exploitation for Repsol in the area of “Casablanca”, off the coast of Tarragona. All these projects put environmental values at risk, plus the social-economic bases of the Balearic Islands and other coastal communities neighbouring the Mediterranean. Do not forget that the ultimate purpose of them all, is to extract oil and / or gas from under the seabed in deep waters, using offshore oil rigs. These are projects of the same nature as the one that caused the largest oil spill in history (three months): the ‘Deepwater Horizon‘ platform from British Petroleum in the Gulf of Mexico on the 20th of April 2010 – an environmental disaster whose effects will last for decades! Our work has been crucial to get the company ‘Services Petroliers Schlumberger’ and, previously, the oil company ‘Cairn Energy’, to renounce their projects of oil exploration in the Gulf of Leon and in the Gulf of Valencia, respectively. Thus, on July 25th of 2016, we were able to announce that after many months of legal struggle by the Mar Blava Alliance, against the illegal project processing of oil exploration, promoted by the company ‘Services Petroliers Schlumberger’ in the Gulf of Lion, and since the Alliance had called the Ministry of Agriculture, Food and Environment (MAGRAMA), the agency decided to permanently prohibit the surveys of this project. In fact, in mid-June 2016, the Mar Blava Alliance, under the provisions of the Environmental Assessment Act, ​registered a request to permanently close the file of this project, before the General Directorate of Quality and Environmental Assessment and Natural Environment (DGCEAMN) of MAGRAMA. 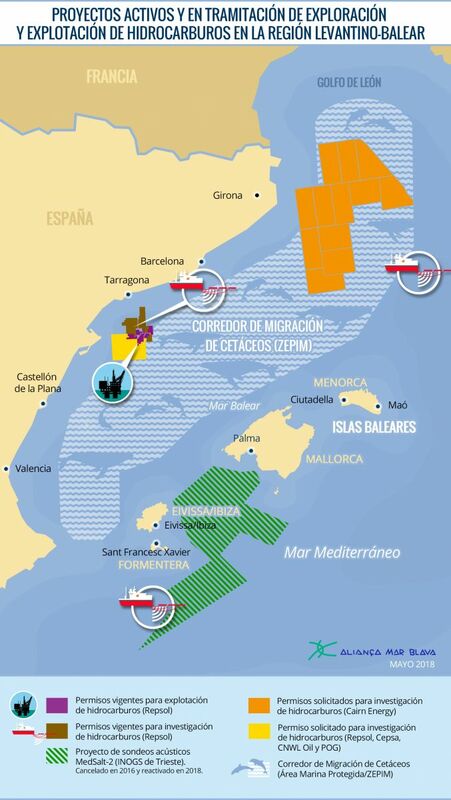 Accordingly, on the July 8, 2016, the Secretary of State for Environment (MAGRAMA) signed the Termination resolution on the project 20140045PHC “seismic campaign in areas free of Leon Gulf off the coast of Catalonia and Balearic Islands“ sponsored by Schlumberger Petroliers Services Branch in Spain, and this was communicated the same day to the Ministry of Industry, Energy and Tourism (MINETUR) as well as to the promoter. To learn more about the details of our work on this file, press here. A year earlier, on the 2nd of June 2015, after two years of unremitting struggle and having prompted an enormous amount of public awareness, more than 128,000 claims against the project were presented. Finally, we could meet and inform the public that the oil company ‘Cairn Energy’ had asked MINETUR for the expiry of the four permits for oil exploration in the Gulf of Valencia (called Benifayó, Gandia, Alta Mar-1 and Alta Mar-2), due to strong social opposition and to avoid receiving a ‘Statement of negative Environmental Impact’ for the phase of acoustic surveys. (Permits by the Royal Decrees 1774/2010 and 1775/2010, which the then Minister of industry, Miguel Sebastian, gave the Scottish company in that political legislature). On the 22nd of October 2015, the BOE published the ministerial order, officially announcing the termination of research permits for oil, from Cairn Energy in the Gulf of Valencia. May 2015: May 2015: Oil company Cairn Energy ‘throws in the towel’, as a result of the enormous social and institutional opposition to their project in the Gulf of Valencia. July 2016: As the Mar Blava Alliance had requested, the MAGRAMA stopped the project from ‘Services Petroliers Schlumberger’ in the Gulf of Leon. June 2nd 2015: after two years of ceaseless struggle from the whole society and having prompted more than 128,000 claims to be submitted against the project, the Mar Blava Alliance unveiled to the public that Cairn Energy had sent a request to the Ministry of Industry, Energy and Tourism (MINETUR) for the expiry of the four permits for oil exploration in the Gulf of Valencia (called Benifayó, Gandia, Alta Mar-1 and Alta Mar-2), due to strong social opposition and to avoid receiving a negative Environmental Impact Statement on the phase of acoustic surveys. On the 22nd of October 2015, the BOE published the ministerial order, officially announcing the termination of oil research permits from Cairn Energy in the Gulf of Valencia 2016. July 25th 2016: As the Mar Blava Alliance had called the Ministry of agriculture, Food and Environment (MAGRAMA), after many months of legal struggle of the Alliance against the irregular handling of these project surveys, the MAGRAMA had to issue an order terminating the case file and project file of the oil exploration, promoted by the company ‘Services Petroliers by Schlumberger’ in the Gulf of Lion. The Resolution was published in the BOE (Official Gazette) on the twentieth of August. The projected survey from Spectrum Geo Limited in the Balearic Sea continues to be processed. In June 2015, Spectrum appeared before the MINETUR (the substantive body), with their environmental impact Study of the project, although on the 20th of April 2016, the 18 months period that the legislation gives the developer to carry out all the activities of phase 2 of the process of environmental impact assessment (“Study of environmental and Impact Assessment, public information and consultation“) ended. Before that date, the promoter and MINETUR had requested an extension of nine months, but the truth is that MAGRAMA had not granted the extension within the time limit. Given this situation, and it being clear that the elapsed time had exceeded the legal deadline of 18 months, in May 2016, the Mar Blava Alliance registered in the MAGRAMA, a request for revocation of the project. However, a month and half later than the legal time limit for this procedure, and despite the case file request (developed both by the Mar Blava Alliance and by the Commission of Environment of the Balearic Islands), for revocation of the proposed oil exploration, the MAGRAMA, with a signed resolution from the Secretary of State for Environment, decided on 3rd June 2016, to provide an extension of nine months, to the company ‘Spectrum Geo Limited’, for it to continue processing its project for the exploration of hydrocarbons in the Balearic Sea. This implies that the MINETUR, which is the deciding body for this procedure could, at any time after that date, published in the BOE, make the announcement of the opening of the public information phase of the Environmental Impact Study and technical project documentation for Spectrum, thus giving the possibility to make submissions to it by citizens, organizations and governments. Remember that the Department of Sustainability of the Coast and Sea of MAGRAMA (DGSCM), in a report (dated November 11th 2014) on this project, opposed its realization by stating that “given the enormous surface where it is intended to perform seismic work and the broad time period involved, it is considered that the potentially negative affect on marine fauna present in the area of action is of sufficient magnitude to advise against the project development”. Since the extension of time granted by the MAGRAMA to Spectrum for carrying out their exploration project is for a maximum of nine months, the new deadline for receipt in this environmental impact assessment, technical project document, plus the result of public information, will be on the 20th of January 2017. (purple) existing permits for exploitation of hydrocarbons (Repsol). (blue) Cetacean migration corridor – (proposed as SPAMI). (green) surface prospecting – project of acoustic soundings (INOGS of Trieste)Last April the MAGRAMA launched the phase prior to environmental consultations of a new project of acoustic soundings, with the dangerous technique of high pressure explosions (airguns) in coastal waters of Mallorca, Ibiza and Formentera. This is the so called “MEDSALT-2 project – marine scientific research in areas under Spanish jurisdiction“, whose sponsor is the ‘Instituto Nazionale di Oceanografía e di Geofisica Sperimentale’ (INOGS) in Trieste, Italy. In this case, the substantive body is the Ministry of Foreign Affairs and Cooperation. According to the promoters, the objective is to “understand the causes, timing, mechanisms of development and consequences, both of local and global scale, the bigger and young giant salt deposits: the upper Miocene salt layer in the Mediterranean basin“. However, it is well known that the oil industry is very interested by these geological salt formations, because therein are the possibilities of finding major hydrocarbon deposits. In fact, we know of the interest expressed by several oil companies in this project, due to the possibilities which opens them for exploration of hydrocarbons. In its response to prior consultations, the Mar Blava Alliance has asked the MAGRAMA for the permanent and definitive prohibition of the MedSalt-2 project (zero option). If, despite the risk of affecting the marine fauna described in the report of the Alliance, the environmental agency does not opt for the ‘zero’ alternative, the Alliance believes that the project should undergo evaluation of Ordinary Environmental Impact Assessment (and not a simplified version, as suggested by the developer), to assess in detail the significant effects and preventive measures. The combination of the MedSalt2 project, with the project of acoustic surveys from Spectrum in the same biogeographic region, determine potential cumulative and synergistic impacts that cannot be ignored, but regrettably this fact was not considered in the report from INOGS. Likewise, in the Gulf of Leon, both research permits requested by Cairn Energy and Spectrum overlap each other and also enter into the Cetacean Migration Corridor, which is irrefutable proof of the negative impact that these projects will have on numerous protected species of marine fauna.